We had this for dinner recently. Yum! Seriously, all these flavors are so good together. 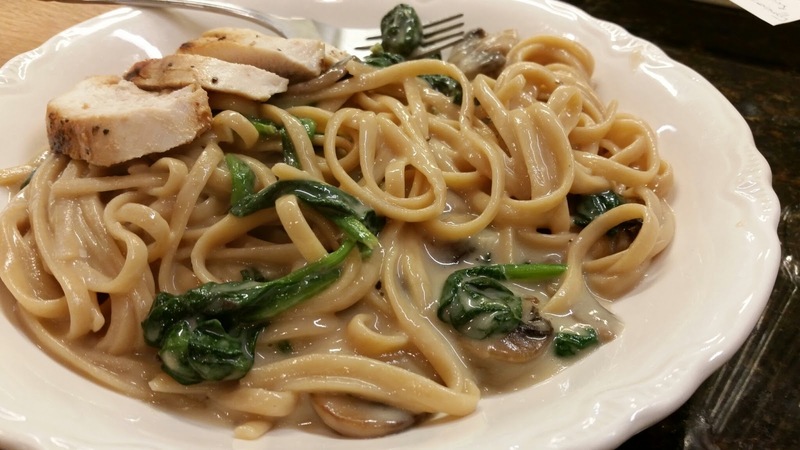 There's just something about mushrooms and spinach, and creamy pasta sauce. Begin cooking pasta according to package instructions. Whisk together flour, chicken broth, milk, salt and pepper. Set aside. In a large skillet, heat olive oil over medium-high heat. Add sliced mushrooms and sauté for 6 minutes. Add minced garlic and sauté for 2 more minutes, until garlic just begins to brown. 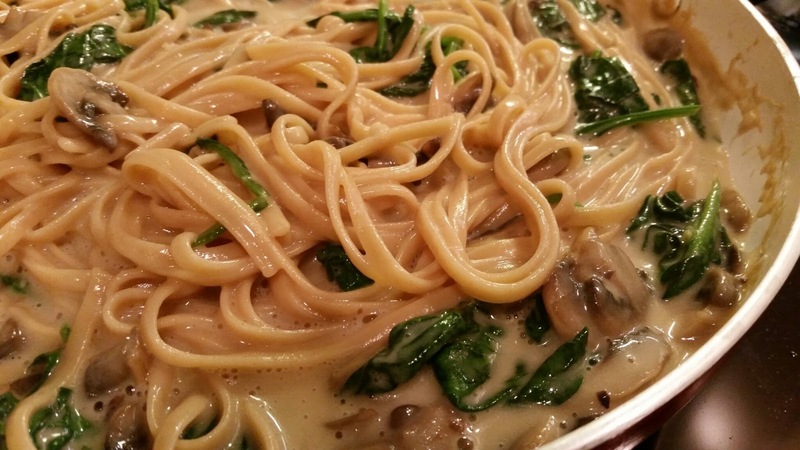 Whisk flour, chicken broth, milk, salt and pepper mixture into mushrooms and garlic. Bring to a simmer and cook, stirring occasionally, until thickened, about 3-4 minutes. Add shredded cheese and stir until cheese has melted. Mix in spinach; stir and cook until wilted. Add a ladle or two of pasta water to skillet, then drain pasta and add to skillet; toss to coat. We had some grilled chicken with this and topped it with some fresh ground pepper. It was absolutely perfect. I will definitely be making this again. The dressing for the Sesame Peanut Noodle Salad I made recently called for sweet chili sauce. 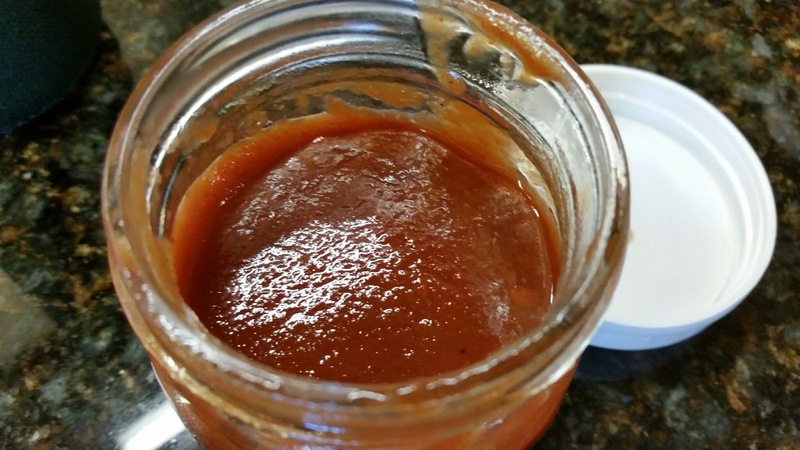 I didn't have any sweet chili sauce and wasn't sure I wanted to buy a whole jar of it. So, I went looking for a recipe to make some myself. I found a recipe on food.com - which I cannot find now. 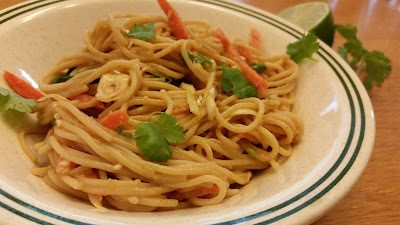 I removed the link from my Sesame Peanut Noodles recipe, because I was going to post the chili sauce recipe separately. And then I forgot to actually start this post and save the link here. I have searched food.com repeatedly, and there are lots of sweet chili sauce recipes, but I just can't find this one. In small saucepan, mix all ingredients. Simmer over low heat until thickened. Store in glass jar in refrigerator. Now, what else can I use this sauce for? Because, even though I did not buy a whole jar just to make the Sesame Peanut Noodles, I do have quite a bit of yummy sauce. I recently saw an ad for Papa Murphy's Thai Chicken Pizza that I'm going to try making real soon - even though I haven't tried the 'real' thing yet. I'm not sure what else. Any ideas? It's time again for Secret Recipe Club reveal! My secret blog assignment this month was Trisha's blog My Hobbie Lobbie. Trisha loves to bake, and she's married to her best friend - we have that in common. She's also into crafting and crocheting, and uses her blog to keep track of recipes and crochet patterns. I never did learn to crochet, but I am amazed by people who can. Trisha lives in Australia, where it's winter right now, so she's making soups and trying to stay warm. I may have to go back and look at some of her soups when winter comes to our part of the world, but for now I thought something cool would be better. Or something to use the produce that's coming out of the garden; I'm getting lots of jalapenos and zucchini. I ended up choosing this Sesame Peanut Noodle Salad because it's both - cool, and it uses lots of veggies. As Trisha said - "You can pretty much alter this salad to accommodate the salad veggies that you have at hand." Perfect! The recipe reflects the veggies I used this time, but pretty much any combination or amount would work. Break pasta in half and cook according to package directions; drain and rinse with cold water. Toss pasta and remaining salad ingredients together in a large bowl. Mix dressing; add to salad and toss well, making sure everything is coated. 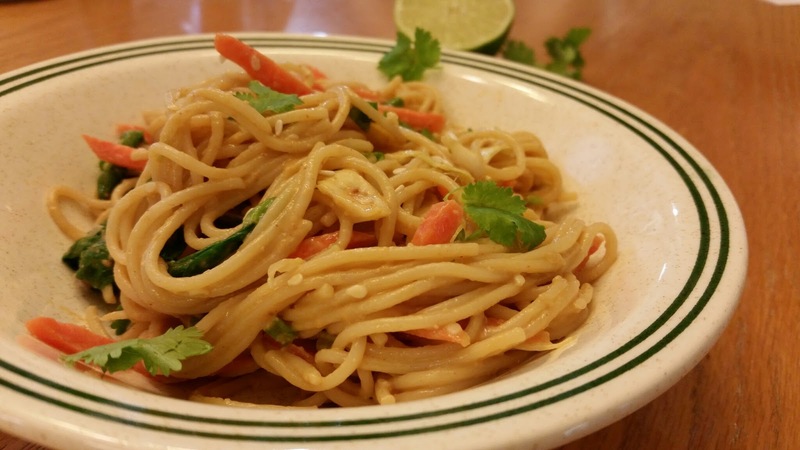 Serve with additional cilantro and sesame seeds to garnish. Refrigerate leftovers.